Ansonia Clock Co., Royal Bonn, "LaPlata", ca 1904. Another very different case. Beginning with a lions head on top, open spaces on the sides, a painting of Holland women below the dial, front feet are decorated with heads of unknown subjects. The cases with Dutch scenes are very collectable. 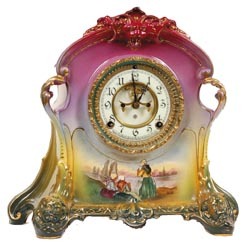 The colorful case is rose red on top, changing to light green and finally dark green on the base. The top has a latticework design. Case is 13" high, 14" wide. Ly-Ansonia, page 605.